John Kerin AM, a Patron of the Crawford Fund, recently retired as the Fund’s Chair. He had an august career in Federal politics and inter alia was Minister for Primary Industries and then Primary Industry and Energy between 1983 and 1991 and subsequently Minister of Trade and Overseas Development (1992-93). John has been a passionate advocate for the role of science in informing policy. We now lack a public debate on aid policy. It’s always sensible to have theories about the most complex and testing endeavours. I have always had a strong belief in the need to have some theoretical backing to policy prescriptions, including an examined view on the lessons of economic and development history. I first studied development economics as an external student with the UNE in the 1960s. Then the debate was part of so-called North-South issues as well as East-West issues surrounding anti-communism. At the time, there seemed to be a far more active public policy debate. Many in our universities were studying aid policy and prescriptions. There is no doubt that the spur to international development, post World War Two, was to address the devastation of the war. The US emerged as the hegemon. Development assistance had the political advantage of advancing US trade interests and its war on communism. But there was also a growing awareness of the desperate plight of people in developing countries in the post-colonial world and the need to find ways of increasing economic growth. The end of the post war boom truncated the emphasis on food supply in the developed world and the role of agricultural production from the late 1960s, leading to aid policy becoming even more complex. 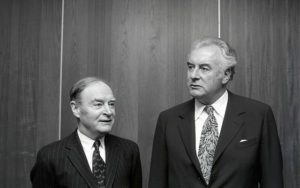 Irish Taoiseach, Liam Cosgrave, and Australian Prime Minister, Gough Whitlam – 1974. Credit: Irish Photo Archive www.irishphotoarchive.ie. Australia’s first aid agency was established in 1974 by the Whitlam Government. The ACIAR was established by the Fraser Government and the Crawford fund was established in the late 1980s. It would seem to me that academic theorising and public policy prescriptions about international development assistance stopped, or at least diminished, by the late 1990s, it all becoming a technical exercise requiring reviews by experts. However, it seemed to me that there had been many discernible trends in world aid directions with differing emphases on, for example, infrastructure, power generation, appropriate technology, education compliance with donor wishes, ‘small aid’ measures, and the importance of compliance. There were no magic bullets and wars, crises and famines led to reactionary responses. When I had Ministerial responsibility for aid in 1992-3 I wrote a policy on development assistance and this was followed by my successor, Gordon Bilney, who wrote a perceptive policy analysis of the topic. In my time I was keen to emphasise a concentration on our region, i.e. the Asia-Pacific, and not to be bogged down in what was largely regarded as the problems of strife ridden, post-colonial Africa and the Sahel. I had a prejudice that the funds we were committing to the large international agencies (IMF, World Bank etc) lacked transparency. 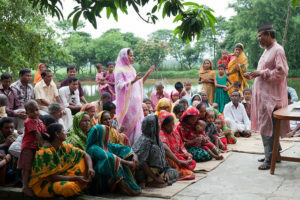 CIMMYT socioeconomist Elahi Baksh gives a farmer training session in the village of Chapor, in the district of Dinajpur, Bangladesh. Photo: S. Mojumder/Drik/CIMMYT. I thought that the best way to expend scarce funds was on the education of women – mainly so that women and girls knew more about their biology and that they were the backbone of much of, so-called, ‘Third World’ agriculture. I also thought that the extension of our research capacity, knowledge and experience in agriculture could and should be shared in our part of the world and in shared climatic zones, e.g. tropical savannas. However, good ideas are of limited use without good delivery. Our former aid agency, last named AusAid, has now disappeared into the Department of Foreign Affairs and Trade, without a public whimper. The only public debate now seems to be about how much the aid budget will be cut in the latest budget. The amount allocated has been severely cut in recent Budgets, though I thought at the time that the Rudd Government had increased allocations too quickly for sensible, well thought through expenditure. Aid bureaucrats will always be criticised. As I understand it, the latest throw of the dice, or international trend, on aid delivery is to hand or ration out cash to better informed people in developing countries because they know better than bureaucrats on how spend it. The new Chair of the Crawford Fund, the Hon. John Anderson, argued cogently in a Crawford Fund submission to the development of DFAT’s White Paper, that aid directed to improving food security is an effective way of improving international and national security. We await the White Paper with interest. The Crawford Fund Annual Conferences concentrate on particular aspects of the challenges, opportunities and options for better aid delivery. This is always in the context of finessing agricultural research and extension to address food security and poverty. This leads us into finding better ways to inform aid policy in the prime area of food production and nutrition and increased food security for developing countries, including the poorest. 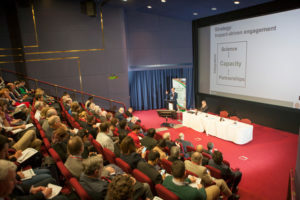 The Fund’s latest Parliamentary Conference, Transforming lives and livelihoods: the digital revolution in agriculture, has again showed how the selection of an apt topic can improve public awareness of the challenges we face and the essential policy debate. Opinions presented here are those of the author and do not necessarily reflect the position and policies of the Crawford Fund.